At Springwell Learning Community we value the diverse ethnic backgrounds of all pupils and families and undertake a variety of events and lessons to celebrate these. We have found this approach to be enriching for all parties as it teaches tolerance and respect for the differences in our community and the wider world. The importance of Laws, whether they be those that govern the class, the school, or the country, are consistently reinforced throughout regular school days, as well as when dealing with behaviour. Pupils are taught the value and reasons behind laws, that they govern and protect us, the responsibilities that this involves and the consequences when laws are broken. Visits from authorities such as the Police are regular parts of our calendar and help reinforce this message. Key stage 3 learned about the tyranny of corrupt power when exploring the play Hamlet, in comparison with the British democracy. Every year a Shakespeare play is performed, celebrating the brilliance of England’s greatest playwright. Within school, pupils are actively encouraged to make choices, knowing that they are in a safe and supportive environment. As a school we educate and provide boundaries for young pupils to make choices safely, through provision of a safe environment and empowering education. Pupils are encouraged to know, understand and exercise their rights and personal freedoms and are advised how to exercise these safely, for example through our E-Safety, S.E.A.L and PSHE lessons. Whether it be through choice of challenge, of how they record, of participation in our numerous extra-curricular clubs and opportunities, pupils are given the freedom to make choices. 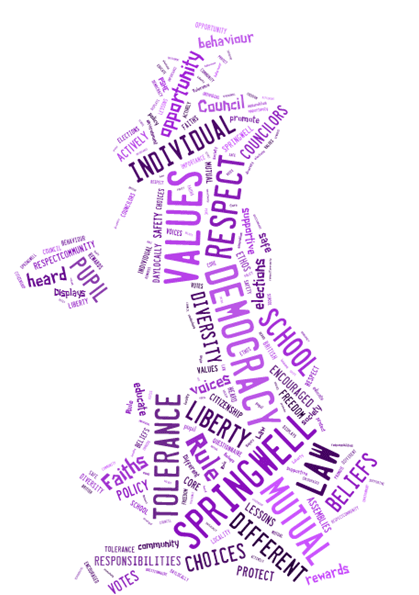 A fundamental value of Springwell is that everyone should be treated with ‘Unconditional Positive Regard.’ This is modelled to pupils throughout the day by staff who will continually teach pupils the importance of showing respect.Part of our school ethos and behaviour policy has revolved around Core Values such as ‘Respect’, and pupils have been part of discussions and assemblies related to what this means and how it is shown. Displays around the school promote respect for others and the annual Community Day promotes respect for our locally. This is reiterated through our classroom and learning rules, as well as our behaviour policy. Both the Elements curriculum and Opening Minds mornings support pupils to develop empathy and understanding of people from different backgrounds. Prejudice is challenged through educating and enlightening pupils to understand different points of view, through the use of story and drama for learning strategies in particular. Displays on Equality and Diversity are in every room, staff work according to the Equality Act 2010 and pupils are taught that prejudice and discrimination towards people in the protected categories is against the law. Opening Minds morning have focused on tackling homophobic bullying and language, racism and racist language and on tackling other types of bullying.